When we pulled into the campsite, the sun had already set – but it was our securities that were about to. My trusty friend, Dave, and I were on the back-side of Zion National Park in the middle of the Utah wilderness. 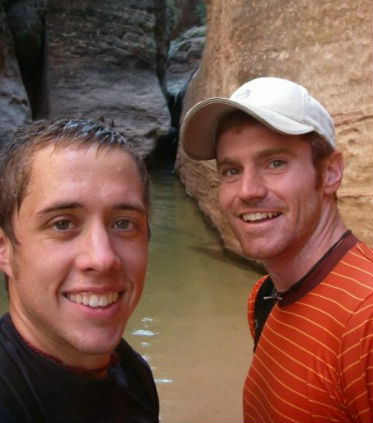 Three hours prior – we agreed to put our lives on the line by canyoneering through a backcountry slot canyon. I did not tell my mother. Aron Ralston had recently (2003) cut off his arm from being trapped under a boulder while canyoneering. The remembrance of that made it tough to sign the waiver – effectively turning my life over if something happens to me – but we each did so. We rolled into our campsite while it was very dark. Fortunately, we didn’t have to hike to set up camp. There was a small circle drive and on the outside perimeter, six or seven campsites. The ranger said we could pick whichever site we desired – for it was not full. Our plan for the next day was to drive our car down to the end of the hike, and then hitch-hike up to the beginning of the hike – the one that would lead us to the canyon mouth. Preferably, we could find someone else doing the hike at our campsite and carpool with them before and after. A good plan. So, before getting some – much needed – rest, I decided to drive around to the various sites to check with the other park patrons to see if we could car-pool. Only, there weren’t any other park patrons at the first few sites. It looked like there wasn’t going to be any at all…until we noticed one occupied campsite. I stopped my car and called out past David – sitting in the passenger seat – to the man. “Are you doing the Subway tomorrow?” I asked in a loud-enough voice for him to hear me. “What? !” the beleaguered man yelled. I got halfway through repeating myself when I realized how uncomfortable I felt. I’ve never seen Deliverance, but I’ve heard it teaches you to be scared of people who live out in the woods. The five seconds from beginning to ask him the question and re-iterating it enabled me to take in my surroundings. An old rusty pick-up served as the backdrop for a make-shift pop-up tent surrounded by 30 years of camping equipment strewn about his site. Normally, I would think this wonderful…frugal, even. But this man (of indiscernable age) chased that scenery with a look of disgust. It looked like anything might set him off. “Ok, thanks,” I quickly said – immediately regretting the decision to enage him. I don’t know why he was ambivalent or why he was angry, why he appeared uptight and that anything might set him off…but I didn’t care. We drove a few sites away and pulled into a lot that was the furthest away from the man’s, yet still close to the entryway. But David and I both knew that we’d see no one else tonight. And after talking to the man, we were unnerved by his angry demeanor, and unsure if we’d ever see anyone else again. I put the car in park – it’s lights shining on the rest of our empty site. David and I looked at each other. Looked back at the man’s site. Looked at our car lights shining on our empty site. “There’s no way I’m getting out of this car,” David said. Seats reclined, we tried to. 30 minutes worrying that I’d open my eyes and see the old man standing at my window didn’t stop me from drifting off into an eventual-sleep. When we awoke, just after daybreak – I poked David in the arm. “We made it,” I consoled. “Let’s get out of here,” he responded. But, driving away from the site of our potential attack, I began to wonder - was it possible that we were just over-reacting a little? Maybe we were just two young men, scared of what we didn’t know. Maybe that man just needed someone to talk to. Maybe he was irritated by us disrupting his privacy. What were that man’s thoughts? We’ll probably never know. But one thing was for sure, the hike was teaching us about ourselves as much as it was about nature. And I knew we'd be wise to remember it.